This month I passed another milestone with this blog: a two-year anniversary. So I wanted to canvas some of the key concepts I covered this year (posts after June 2013). Second, there has been a whirlwind of press coverage about addressing ‘a skills gap’ in K-12 and higher education. Employers claim college graduates do not have the technical skills for jobs they are looking to fill. In response, the administration is pushing to increase STEM (“science, technology, engineering, and math”) bound students in K-12. Third, online learning is growing rapidly for a few reasons. It is an effective tool for personalized learning and mastery, provides feedback loops to teachers and educators, and is a cost-effective way to reach the masses (demonstrate by the success of MOOCs). According to Clayton Christensen in Disrupting Class, by 2019 50% of all K-12 courses will be online. 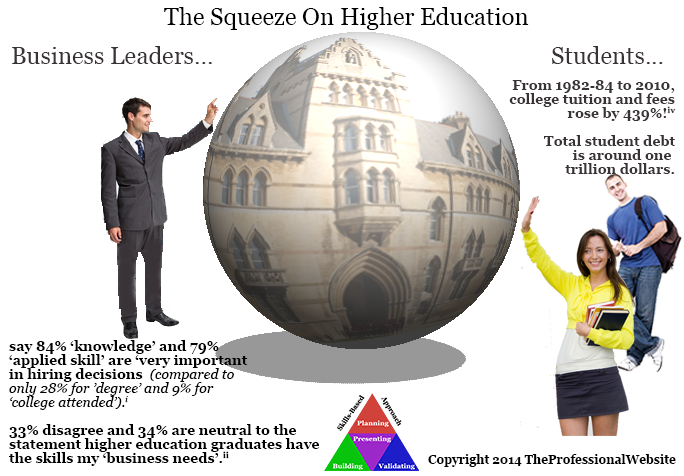 Fourth,in a few blogs, I discuss the issues related to the escalating costs of higher education. There is going to be reform in the upcoming years to control rising student debt. It has a ‘snowball effect’ on young households’ investments, less can afford to buy houses and cars. Students are going to have alternative choices to a traditional college education, such as technical internships and online learning solutions. To control cost inflation, colleges will blend online and traditional learning channels. 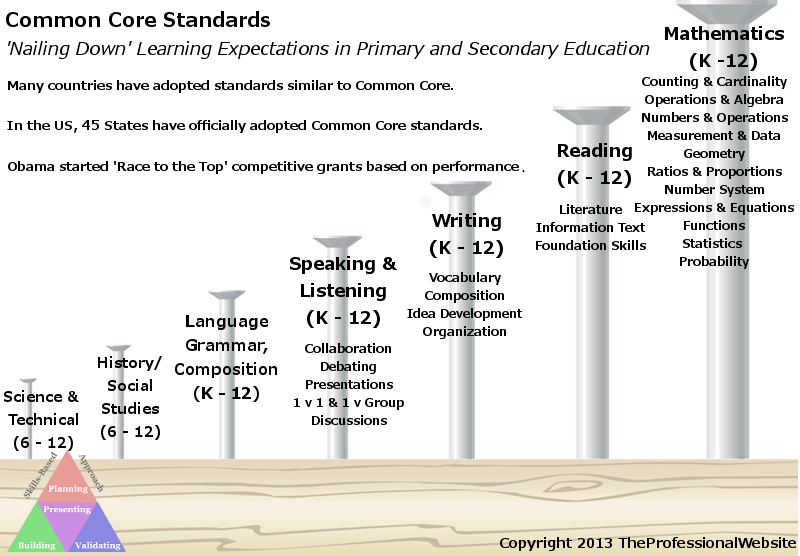 Fifth, I advocate the whole concept of Common Core in K-12 along with the 45 states that have already adopted it; I dedicate a few blogs discussing the advantages of Common Core. I think is a powerful way to get teachers, administrator, politicians, and third-party organizations (such as online learning platform and game designers) in synch with a set of transparent learning expectations by subject and grade. The standards are posted on a publically accessible website for all interested parties to view. Currently, some parents and teachers are complaining about students underperforming; two states have recently dropped the standards. I think we have to be patient with the testing, and embrace all the benefits of Common Core – far beyond test results. 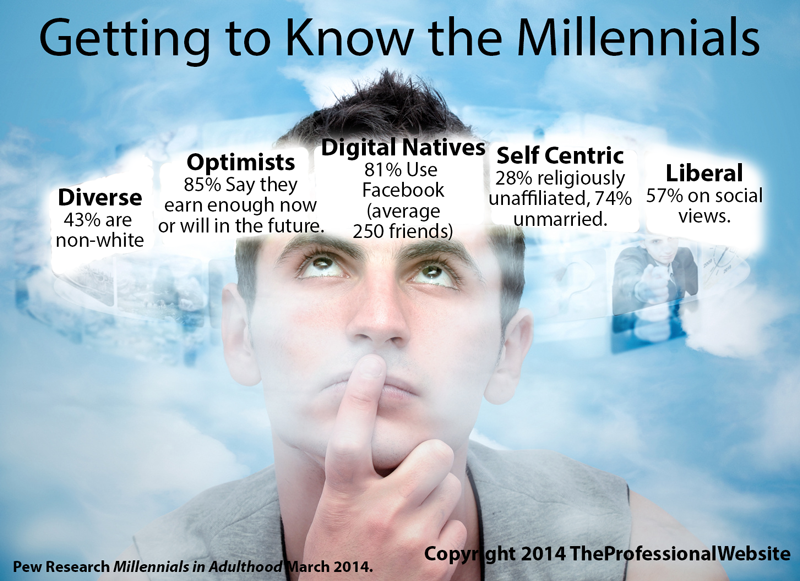 Sixth, millennials are the buzz. This upcoming generation is comprised of ‘digital natives’ and represent a large segment of the workforce (36 percent). There is going to be a ‘tug of war’ with Millennials and Baby Boomers for influence in years to come (something Paul Taylor talks about in The Next America). Seventh, I spend a couple of blogs talking about leadership. In this Information Age, there are going to be smaller, nimbler companies. More professionals will be required to take on leadership roles. There is also going to be an emphasis on building the team. Finally, I have been working on an online personal branding concept, something I feel is a logical extension from the Skills-Based Approach methodology I shared last year. It is also closely intertwined with a personal website – a centerpiece of an online personal brand. To learn more about personal branding, buy the book Online Personal Brand: Skill Set, Aura, and Identity. Marketers, technologists, educationists, politicians, and many others are trying to define the much hyped Millennial generation. Some of their generalizations include, Millennials are: digital natives, religiously unaffiliated, self-centered (perhaps by necessity), supportive of social welfare issues, better educated, demographically diverse, unmarried (and likely living with parents), and optimistic of their future. The Pew Research Center recently published a study called Millennials in Adulthood with some eyebrow raising statistics. Millennials are digital natives, meaning they were raised with the prevalence of computers and devices, social media, video games, apps, and the Internet. Eighty-one percent on are on Facebook and have a median of 250 friends. Technology has a major influence on education for a few reasons. First, online learning platforms make personalized and adaptive learning a reality. Second, information is easily accessible to all. (Personally, I think this is huge. I enjoy reading newspapers and journals online. I love searching whenever I confront a subject that interest me.) 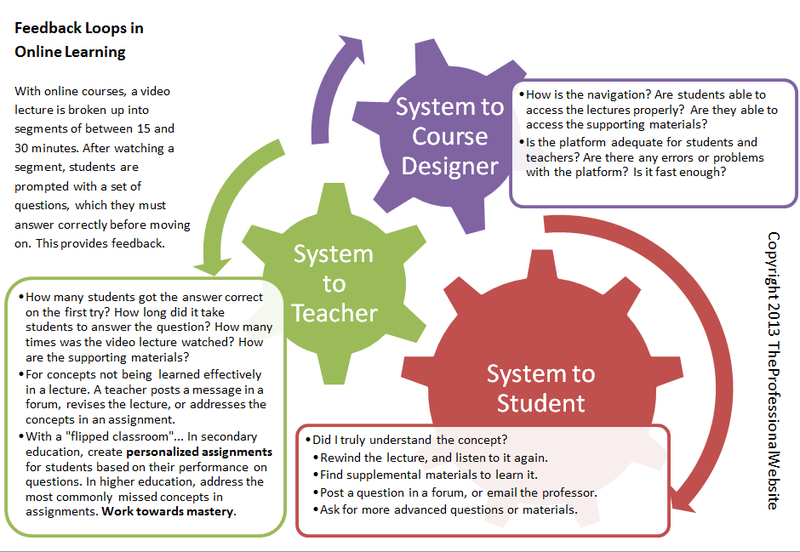 Third, discussion forums make feedback and social learning possible. There are issues with technology and learning. Multitasking is a requirement for just about everything Millennials do, but clearly, it disrupts their ability to concentrate and become deeply engaged. Another potential problem is to take shortcuts in gathering information. Why read a respected publication when you can read a summary article? It is extremely easy to do and saves time and money. Finally, newspapers challenge us to think of important issues in the world and our community. Does social media – for many a replacement to news – generate the same kind of intrigue? Despite being saddled with more student loan debt than any other previous generation and having little assurance social security will be there when they retire, Millennials are notably more optimistic than other generations. A whopping eighty-five percent say they are earning enough now or will in the future. (Significantly higher than any of the other generations). Many from past generations paid off their student loans within a few years after graduating (the ratio of debt to annual salary was much lower and the cost of living was lower), so it was never really an issue. However, Millennials are confronted with lifelong debt. Where does the optimism come from? I think it is a generational thing. Millennials are happy as long as they can pay their bills and are socially engaged; many are paying rent and living with parents. Student loans are simply another bill, and like a future mortgage on a home, something Millennials expect to pay for much of their lives. It is nothing more than an accepted reality, so why stress out about it. Millennials are less religiously affiliated than other generations. Interestingly there is a trickle down effect, where each subsequent generation is less religiously affiliated than the previous one. Twenty-nine percent of Millennials are religiously unaffiliated (thirteen percent higher than the Boomers). I think access to information enables younger generations to contemplate religion. For example, there is a series of videos on YouTube of Oxford lecturers debating the question on the existence of a God. Probably the only comparable experience from a previous generation is a Humanities course in college where exposure does not occur until someone is in their twenties. Truth is most Millennials believe there is a God (eighty-six percent), though only fifty-eight percent say they are “absolutely certain” there is one. There are other issues for lack of religious affiliation like getting married and starting a family later in life. Altogether, I think the biggest reason why Millennials are getting so much attention is because they are digital natives (and few experts accurately predicted how fast technology would influence our lives). Having access to vast amounts of information and being able to communicate instantly in social communities has and will have dramatic implications for generations to come. Biologists are studying the effects on the human brain. Educators are trying to understand the best ways to utilize technology for adaptive learning. Employers are desperately trying to keep up and hiring candidates with the necessary technical skills. The excitement is in trying to figure out where the Millennials are going to take us. I suggest reading The Next America: Boomers, Millennials, and the Looming Generational Showdown if you want to read a thorough analysis on our current generations. Hire Someone Oozing With Talent But Not A Team Player? A lead programmer knows how to best architect an application or website. Doing it right the first time is so important, especially if it is the crux of your business. A graphic designer creates something that is stunning and leaves a lasting impression on your company brand. It is doubtful two graphic designers ever produce the same product. A leader juggles many responsibilities as he or she tries to synchronize the objectives of the company. Two leaders never take the same approach. How does ‘likeability’ fit into the equation? Measuring ‘likeability’ is difficult because it is subjective and team dynamics are complex. Besides, you may work with someone you do not like but use good soft skills and learn to tolerate him or her. One way to understand the functioning of the team is to sum the value of the product or service the team produces collectively. You can tinker with various team scenarios and compare the different outputs. As team members are added, the total value may increase or decrease; therefore, it is not solely dependent on talent. A ‘star’ has the potential to make a huge contribution. Contrarily, a ‘sapper’ can do a lot of damage. 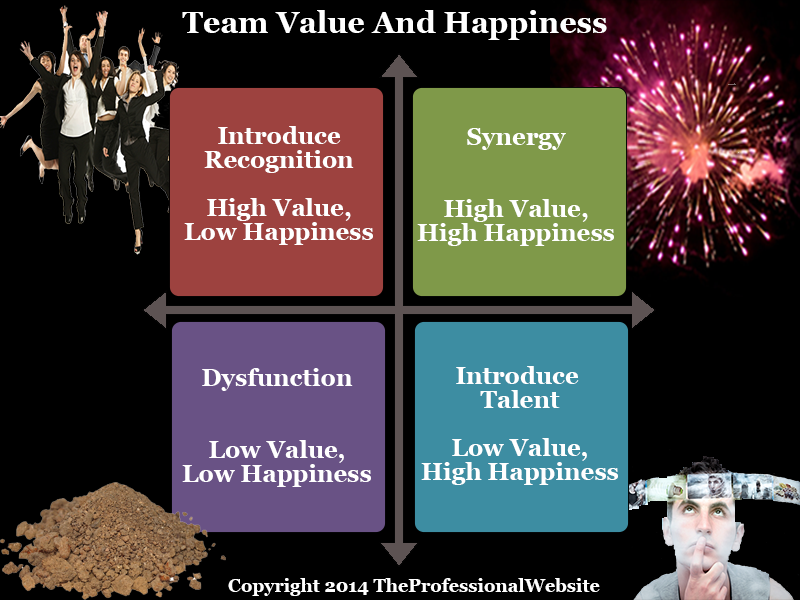 In case the ‘total value’ does not capture the wellbeing of the team, I add another ‘total happiness’ index. What makes this is a complicated issue (and probably why companies are willing to invest a lot towards talent) is one talented individual can fundamentally change the whole complexion of an organization whether or not he or she is liked. Think about the situation of Steve Jobs. He had the initial vision for Apple, and was crucial in making it a pioneer of personal computers – clearly has an abundance of talent. However, later on, he was let go and worked for another company. (It is hard to say if it had to do with ‘likeability’, nevertheless, it is clear he was at odds with management and not necessarily a team player. At least this was my interpretation of the situation based on the biographical film Jobs released in 2013.) Years later, Apple brought him back as an advisor and then CEO. He then led Apple to its legendary rise to the top of the industry. Would you hire someone oozing with talent but not a team player? Extreme talent is probably worth the investment. Of course the caveat is talented professionals should try to be ‘likeable’ (rather than ignoring it). When two professionals have similar talent, it is worth considering ‘likeability’. Build a happy team. Productive and happy teams have more longevity. Fulfilled team members are less likely to leave for other opportunities. ‘Talent’ and ‘likeability’ are not completely independent of each other. Invest in talent to create a thriving workplace and this might make a happy team– there is satisfaction in generating value. Invest in getting team members to like each other. There is a positive vibe, and random interactions may spur innovativeness (something talked about in the Wired article). For a previous employer, I coached all of our sports team. There was talk around the office about resurrecting a company softball team, so I started the co-ed, all-inclusive team – everyone from entry-level to senior management played on the team. The effect was huge: active participation, camaraderie, newsletters, nicknames, jokes, coffee talk, and so on. Later I added a soccer and basketball team. I think leaders should consider introducing meaningful, out of the office team building activities, such as sports teams. It breaks the rigidity and formalness of the workplace, and lots of times helps foster lasting friendships. 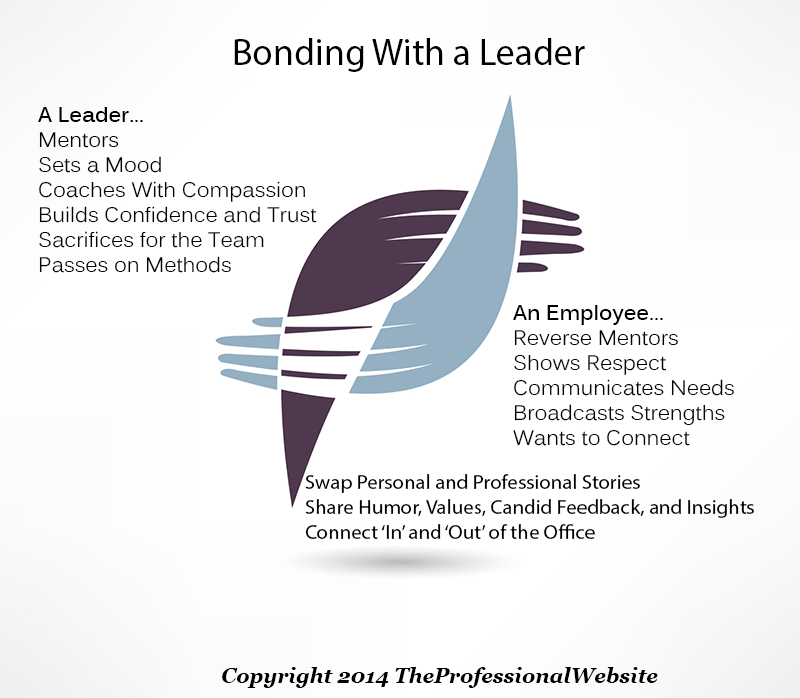 Author TheProfessionalWebsitePosted on February 14, 2014 February 15, 2014 Categories Career DevelopmentTags likeability, team dynamics3 Comments on Hire Someone Oozing With Talent But Not A Team Player? There is a benefit in presenting your skill set to not only recruiters and potential employers, but also an ‘internal network’ – co-workers and supervisors – and an ‘external network’ – partners and clients. As I talk about presenting a skill set, I want to clarify that there are many ways to present a skill. (Feel free to read more about them on the website: www.skillsbasedapproach.com.) I strongly advocate utilizing skill sets because they represent your functional capabilities to everyone in your target audience. Skills are universally defined (for the most part) and portable across platforms and their competencies are measurable. It is advantageous to have your skill set accessible to your co-workers – what you ‘bring to the table’. The biggest benefit comes when you work on a team, where everyone knows the skill set of each member. Moreover, the level of expertise and validations of the skills are also known. This greatly improves the team’s productivity in three ways. First, there is quick familiarity. Team members spend a few hours reviewing each other’s skill set so they have some idea of what each other’s contribution should be. Otherwise, without reviewing skill sets, it often takes weeks for teams to really get to know each other’s functional value. Second, it is an accurate portrayal. 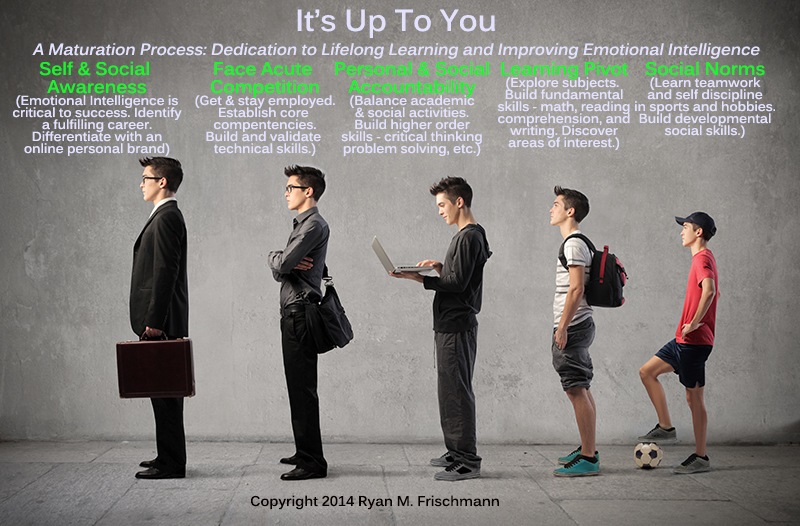 Skill assessments and validations that accompany the presentation of a skill set properly portray skill competencies. Unfortunately, the way teams function today is often ‘trial and error’. Third, it can help teams become more horizontal. An awareness of each other’s skill sets removes communication barriers, so members feel on more equal status. There may be less need to have a ‘formal leadership’ or direction. When I was in business school, I remember Gallup provided our MBA class with their ‘Strengths Finder’ service – a survey, report, and seminar. You take an hour-long test and receive a report with a ranked list of your top 36 strengths, and in the seminar, a Gallup presenter discussed the results. My class was enthralled by the whole experience. There were two big takeaways: no matter how well you know someone, it is almost impossible to identify all their strengths without an assessment; and by knowing your teammate’s strengths, you know how he or she makes the most impact. In addition, you may learn a teammate’s weaknesses which can be constructive with team dynamics. I suggest taking the Gallup Strengths test and sharing the results with your team. To present your skill set to co-workers, you should keep your skill set current in your LinkedIn profile and utilize a personal website. I suggest a personal website because it gives you more flexibility to share your skill set in different ways. There is a lot of talk about the best way to conduct ‘performance reviews’ or ‘performance coaching’ or ‘mentoring’. Whatever the case, it should be a conversation based on your skill set and in the context of a Skill-Based Approach. Present your skill set to supervisors and talk about the fifteen to twenty skills on your personal website and/or LinkedIn profile (and soft skills that may not be included). Talk about your short and long terms objectives since you started working. How are the objectives materializing? Are you satisfied in your current position? Discuss your progress in building the skills over the prior period. What projects did you work on? How are your soft skills with coworkers and clients? How did you perform on assessments? Collaborate on a short-term plan for the upcoming year. Base it on the development of a skill set. What company resources do you need to build skills (i.e. training or online courses)? 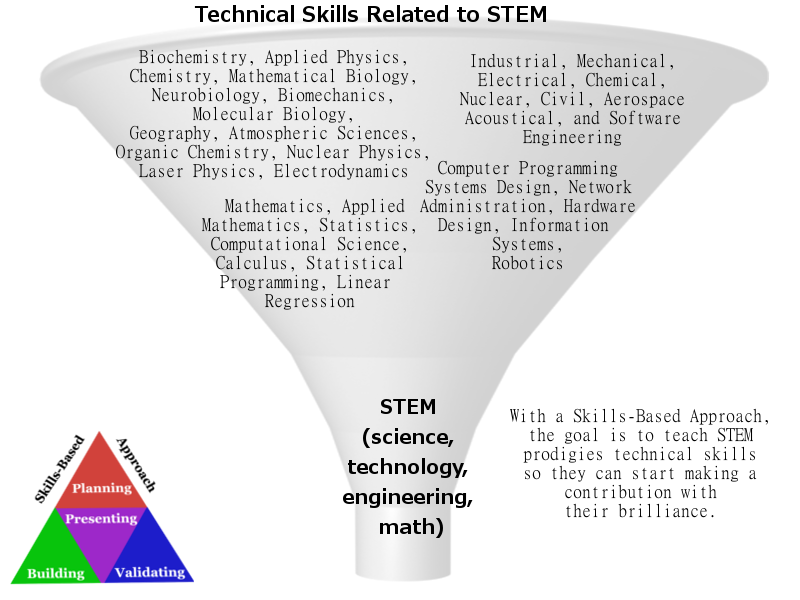 Brainstorm on the validation of skills in the long-term. Are you going to need accreditation to move up in the company? 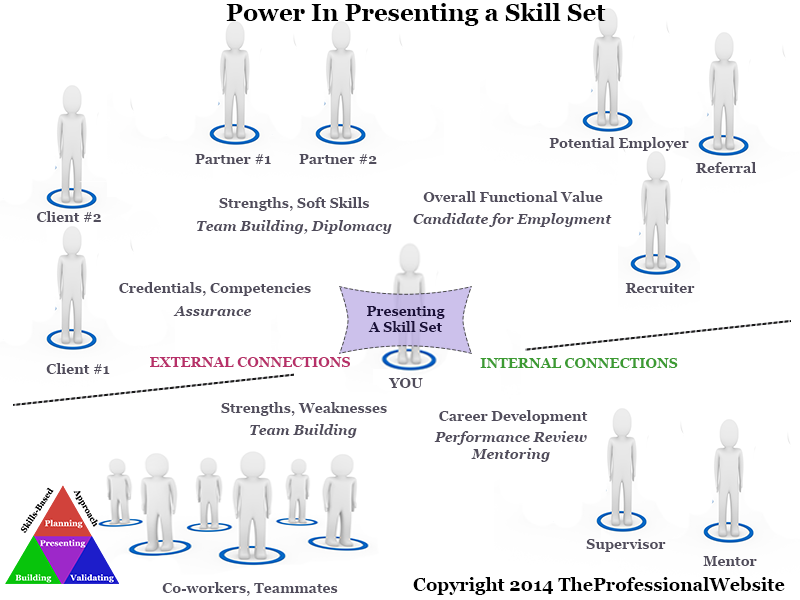 Presenting your skill set to your external network – clients and partners – can be useful in your current position. Clients love to be reassured. Perhaps your company sold them on a product or service, but now it is time to sell them on you as you deliver on your company’s promise. Sharing your skill set with competencies goes a long way in convincing them you can do the work. Partners are an extension of your team. So there are the same team benefits mentioned above. However, the difference when you work with partners is that you are usually the ambassador for your company – so include soft skills as part of your skill set.